It was a beautiful weekend here in the Washington area. I spent Friday and Saturday up at Sweet Clover Barn and Sunday at church, taking a hike with my family and watching some football. The barn was brimming with vintage finds and fall decor. I thought I would give you a little recap and let you know what’s still available just in case you missed it this weekend. I was asked recently to summarize my shop’s style in a few words. 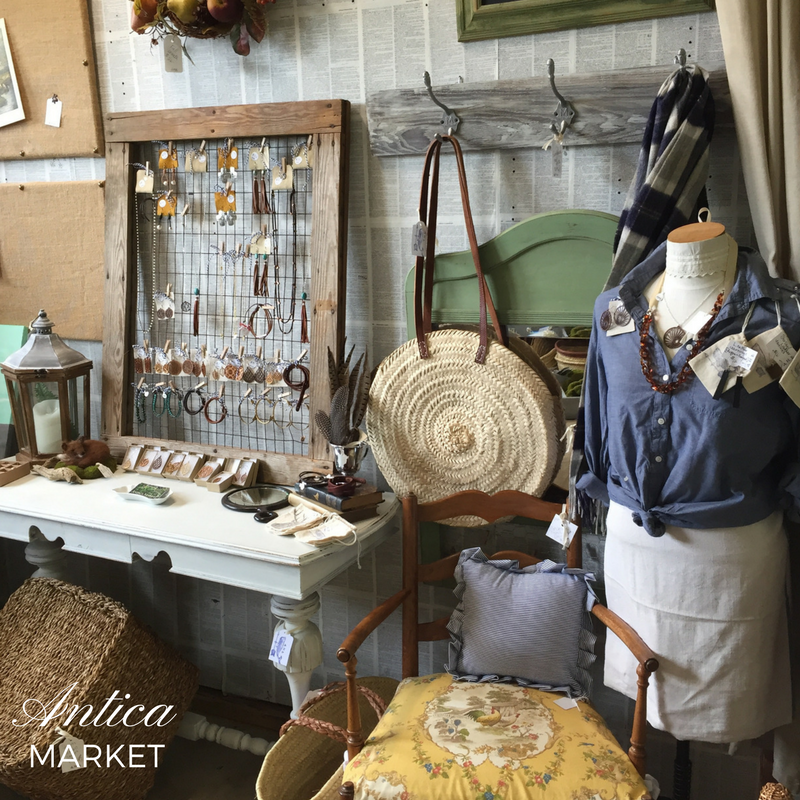 I thought what would best describe Antica Market’s style was Preppy European Farmhouse – kind of a Ralph Lauren, English Country and Farmhouse feel. 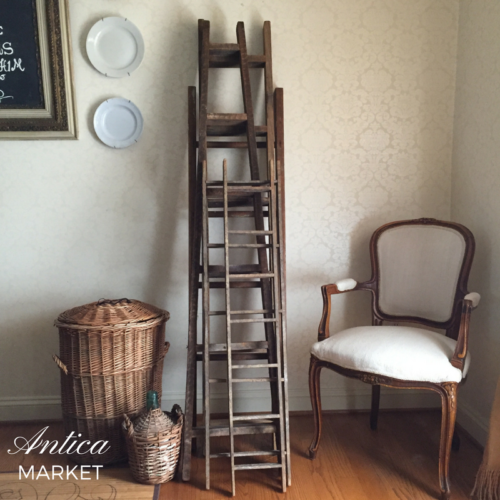 I love how this picture of some of the rustic blanket ladders, vintage wicker and french chair captures that. I brought the ladders to the barn this month in a variety of sizes – there are still several available, as well as the large wicker basket. 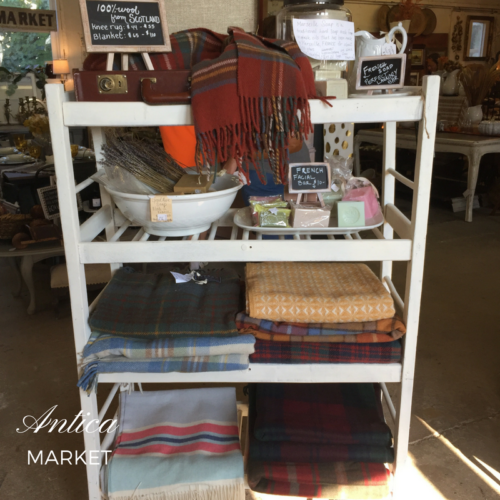 The wool blankets from Scotland have arrived. You should have seen me when the boxes were dropped on my doorstep – I was like a kid at Christmas! There are two sizes, knee rugs and full size blankets. 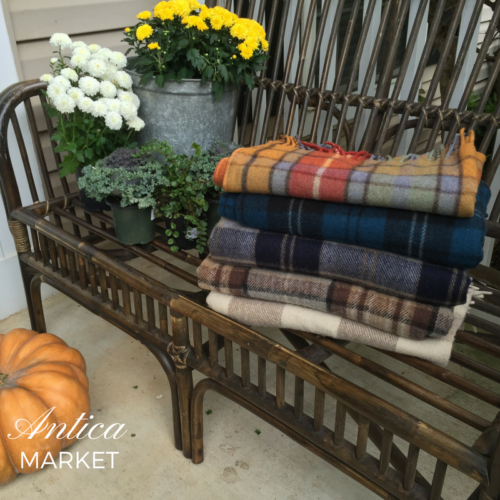 The knee rugs make nice lap blankets, table runners or even a shaw on cold fall evenings. On Friday a young couple bought the beautiful English walnut dresser I had for sale. It was such a nice piece with gorgeous wood grain. 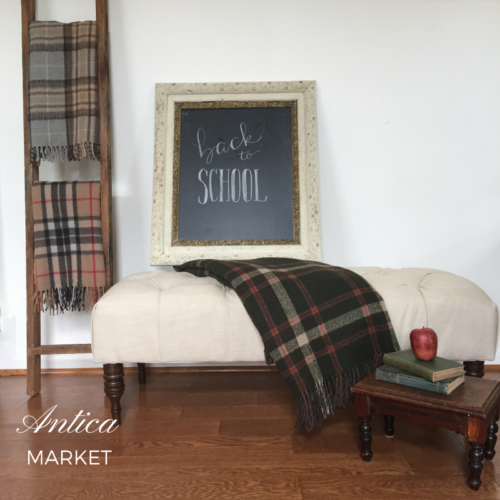 The linen tufted bench also found a new home. There was a lot of interest in that piece, so I will have to keep my eye out for another similar project. This particular bench was gifted to me by Marian Parsons (aka Miss Mustard Seed) at her yard sale. It was a piece that she intended to get done for Lucketts, but didn’t find the time. I’m grateful that she entrusted it to me. 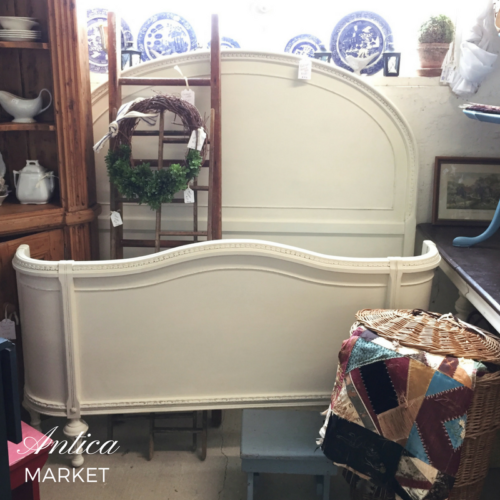 I have a gorgeous vintage full size bed that would be perfect for a kid’s or guest bedroom. 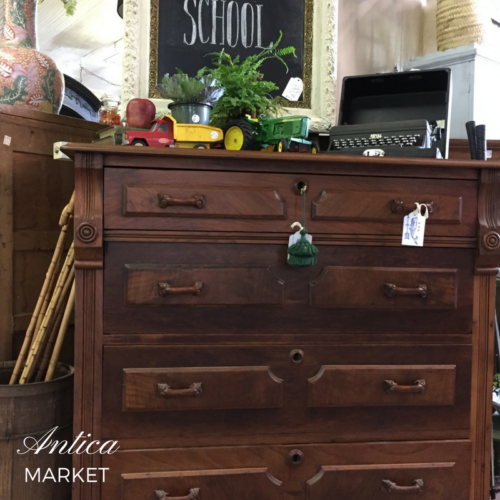 It has a curved footboard, charming detailed molding, and wheels on the headboard. 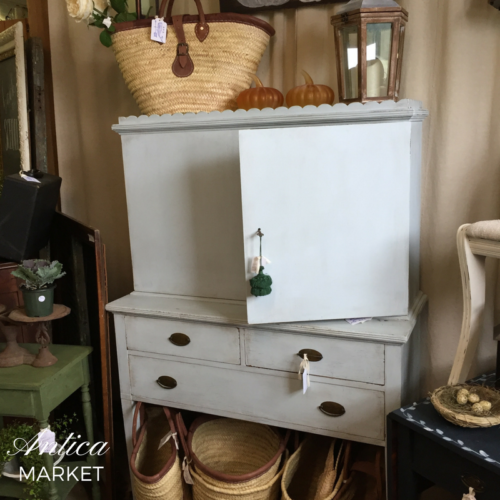 It’s painted in Old White by Annie Sloan Chalk Paint. Also available is another upholstery project. 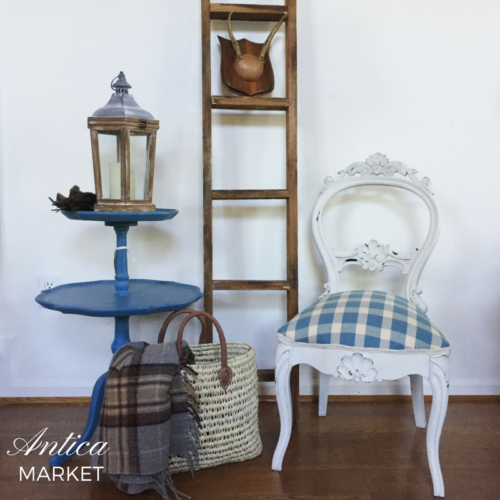 The little antique mahogany balloon back chair and piecrust blue table. 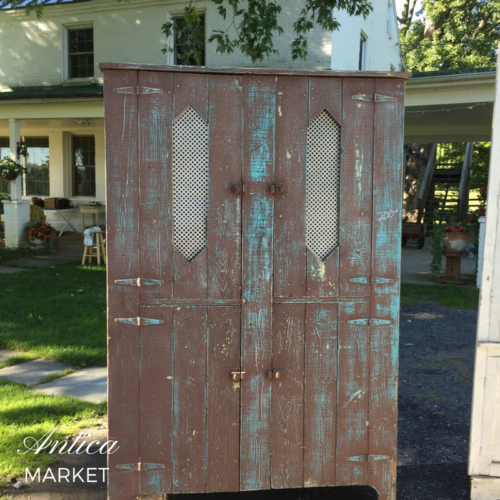 Also in shades of blue – this little hutch. It has a shelf behind the cabinet doors that is removable. It would make cute storage for books, blankets or craft supplies. If the shelf is removed it could also hold a small TV. I introduced a couple new lines of jewelry this month too. 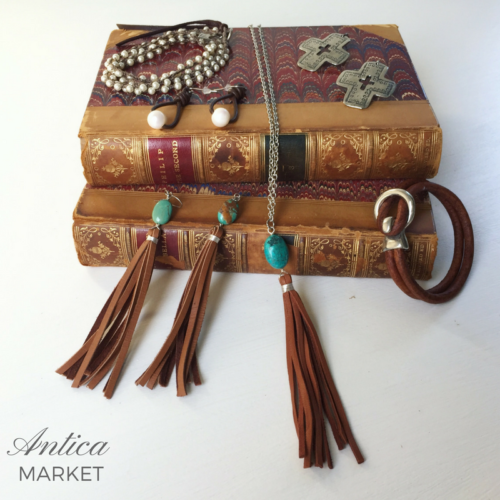 This line has a western flair with leather, natural stones and pearls. The other line of jewelry is made of laser cut hardwoods. 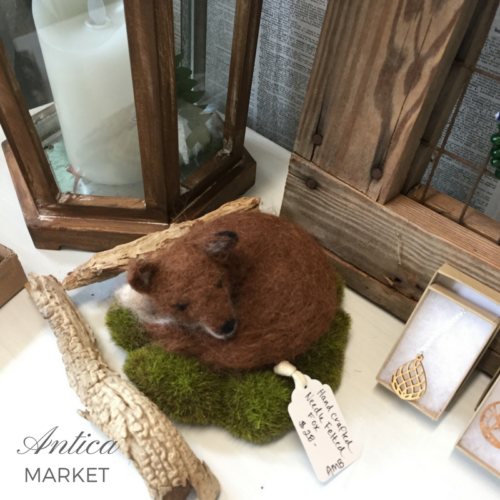 Here you can see just a peek next to the little needle felted fox. I also did a little shopping myself at the barn this weekend. I picked up this farmhouse hutch to work on. I’ve already been surfing Pinterest, dreaming up a color palate. I hope to get right to work on it and have it ready for next month’s sale. I love the Fall decor! Any Fall decor is beautiful! There’s just something about the colors of Fall, the air getting cooler, and a trip to the pumpkin farm. I love it all! I’d love to visit this place! I am really digging the photographs of the décor! I would love to get my hands on one of those wool blankets from Scotland. I wonder if they would be able to customize it to match our family crescent’s colours. I also enjoy restoring old furniture, I love your English walnut dresser! Wow this market looks amazing! I wish I lived closer. What a gem. These are some awesome treasures. I love the new jewelry collection. I wish sales like these were local to Delaware! This looks like a great experience. I’m sitting here a little envious. I want those wool blankets from Scotland. I would use them as lap blankets on cold winter evenings. Is that a fox? Did you felt a fox? I need that right now for my Woodlands Nursery. Love it! Yes. I was going to make a hedgehog next. I can send you the little fox. Oh man, whenever my husband and I finally move into our “forever” home – we will get serious about furniture and what not. We live in a condo that is not permanent, so every time we think about new furniture we just think about having to move it to a new place at some point. So we might as well USEEEEEE what we’ve got until its last days! I am totally in love with fall. I am also in love with the walnut dresser. I love to collect pieces that you could only imagine the stories it could tell. Wish we had a store just like yours around me. I love this country farm collection. I can’t wait to decorate for Fall with flannel and pumpkins!